At the corner of Main St. and Exchange Blvd. by Tim Hortons as I looked up at Times Square(TSB) I spotted Orion on the north end of the wall. What a great way to start a fledge watch! 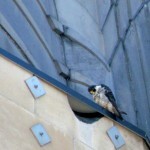 The only problem is that he didn’t fledge today but I surely enjoyed sharing space with him and his fantastic parents. 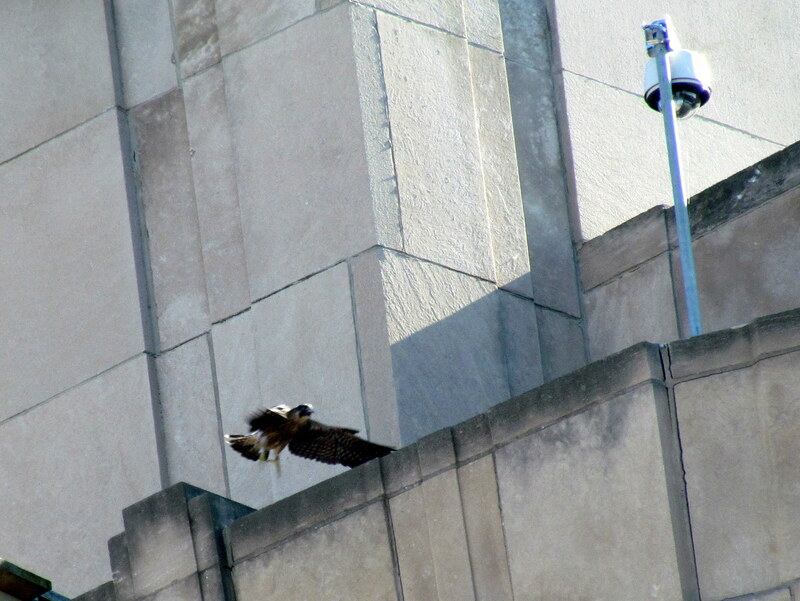 First Dot.Ca(DC) made a small food drop for Orion before a minute went by then flew up under the southeast wing. Then Beauty came in and fed Orion as dad went over to OCSR . As Beauty finished up the leftovers Moon came by and asked if I was MAK. She is a co-worker of Patsy at the Thomson Reuters building. 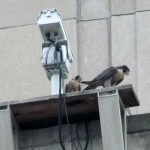 Brian,DebbieH and her co-worker Marianne joined our fledge watch. And later on SusanC and Aaron also came by. We had a visitor that may or may not have been Pigott. Beauty and DC took off at the same time flying east,next Brian and I saw 2 pefas over the river Brian thinking they looked like the same size so could have been Pigott and Beauty. We lost them behind the Thomson Reuters building as the one that was trailing looked to me like it started to dive bomb the other before vanishing. Next, Beauty(I mistakenly reported it as DC) came in and landed on the north end of the wall and made her way to the deck where we were told she had Orion laying at her feet in a submissive posture and he was quiet immediately. I feel she was protecting him by stopping him from bringing attention to himself with Pigott or a rogue falcon out there somewhere. 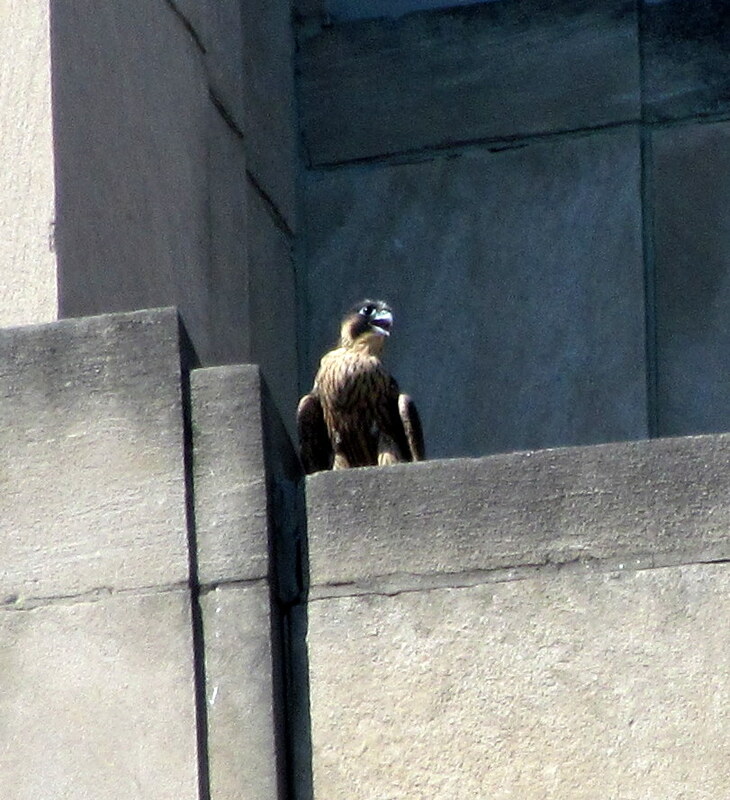 Anyway, she went under the southeast wing and later DC returned to land under the northeast wing. Bookend guards for our precious Orion! There was a mistake in identity later on that occurred that I think SusanC should tell in her report. CarolP didn’t tell in her report but it involved her too. Funny stuff! 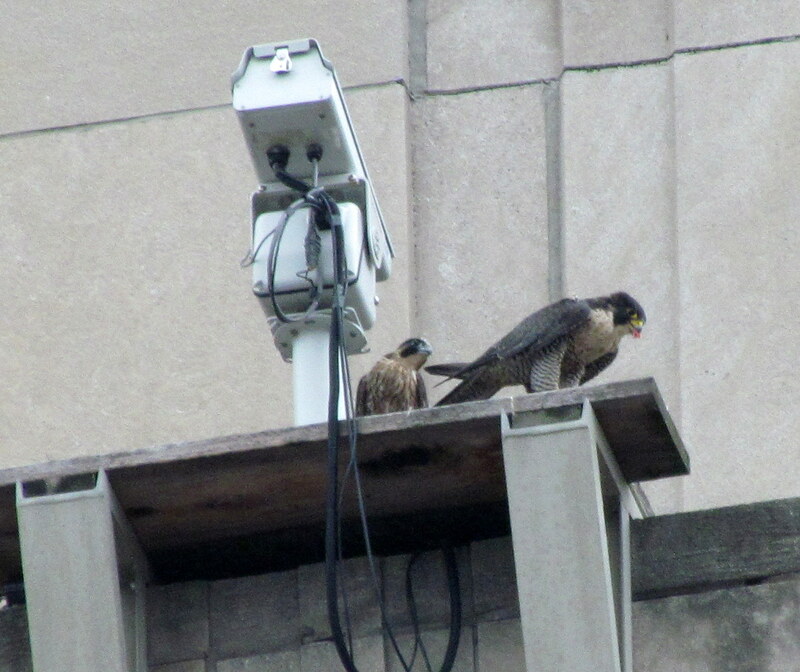 I’m sorry this isn’t as detailed a report as it could be but the hour is late and another day of fledge watching will be upon me soon. The end of the nite included watchers-Brian,Joyce,Susan,CarolP,KathyO,Jeanne,LarryO,Marcia,Carrie,Shaky and myself. Another long day with plenty of smiles to go around! Waiting is ok with me. The longer Orion takes to fledge, the stronger he will be. I’ll let others cover what happened during the day. We had some excitement which I’ll let others report about . It was a very long, very warm day spent with my Watcher friends and so many visits by folks just walking through, wondering what we were doing. I was very happy to see Kris G and her husband Bill, who spent a few hours with MAK and I this morning. From 4:00 pm to 8:15 pm, not much happened. Just a bit of flying by Beauty and Dot.ca. Orion seemed to be tuckered out and laying low at the nest box area. Although he did do his share of flapping and doing short flights over the well wall and back to the nest box. He is definitely getting stronger every day and will soon fledge. Today, it seemed that he was getting a lot of food from his parents. He is definitely mostly eating on his own and needs no help. Although Dot.ca continues to feed him beak to beak when he can. By the end of the evening, many of us decided to call it a night. I received a tweet that after I left, more food was dropped at the nest box for Orion. They weren’t sure if the dropper was Beauty or Dot.ca. Tomorrow is another day and maybe Orion will take that step off the wall to the rest of his life. 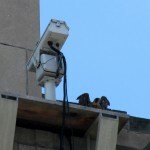 Watchers while I was on Fledge Watch today: Kris G, Bill, MAK, Kathy O, Brian H, Susan C, Jeanne, Joyce, Larry O, Carrie, Shaky, Marcia, Aaron, Pat, Debbie H and me, Carol P. Hope that’s everyone! Tomorrow we’ll be back on the job, keeping our eyes to the sky in hope of seeing Orion’s first flight! Be safe and strong when you fledge Orion! Well after a 14 hour fledge watch and 2 hours to upload pics and videos I guess I don’t need to tell you that I am tired. Therefore this report will be short and sweet. The day started by catching the 6:01am bus downtown where I joined Dan on the Broad St. Bridge who had been there since 5:30am. He got me up to speed saying that he hadn’t seen Beauty and Dot.Ca had fed Orion a small snack just before 6. Orion was on the roof of the nest box and at 7:00am Dan left for home. Right after Dan left Beauty brought food to the deck and made her way to the nest box with breakfast. She seemed to be trying to get Orion to come down and finally she left with it when he didn’t comply. I moved down next to He’s Chinese joint to keep close tabs on Orion who had ventured out on the well wall. He actually flew from the deck to just in front of pan cam on the wall giving me heart palpitations. 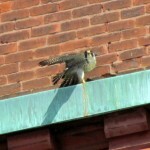 I thought he was gonna fledge right then and there! As it turned out he did a lot more of that today but never fledged. I think tomorrow is the day. KathyO joined me around 9:00am and we moved to the hole where there was shade. Barbara stopped for a few minutes and when she left CarolP and Linda(Braveheart) showed up followed by Patsy and LarryO. 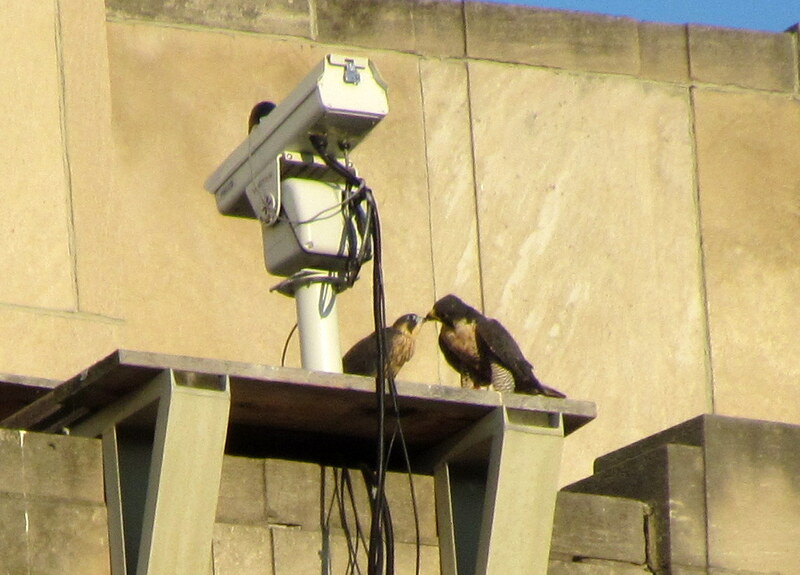 Meanwhile, DC had brought food and was feeding Orion at the north end of the wall. It was a frenzied affair as DC couldn’t shovel it into Orion fast enough! Joyce,Dana and Lou joined the gang while Beauty and DC were on OCSR watching their kid have a blast running along the well wall. Basically that’s how the whole day went-Beauty hung out on OCSR,DC flew around chasing crows and hanging under the wings and on the Times Square building and OCSR. O sang a lot of the time, as a matter of fact I got many pics of him singing his songs. Watchers came and went all day and at the end of the night 10 of us were present-LarryO,Aaron,Joyce,Dan,Jeanne,Brian,CarolP,Dana,Marcia and yours truly MAK. Orion was a joy to watch and also gave us a lot of angst for his antics on the wall. Short flights down the wall and in the nest box area and running along the wall made for some very entertaining and smiling moments! Well, so far no fledge yet by Orion, but he is getting closer and closer. He has graduated from nesting to ledging. 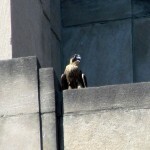 Next Fledging! These are the same steps that Jemison and Callidora took in 2010. Orion is following in their big yellow footsteps. Many Watchers were out this weekend for hours, from dawn to dusk, wanting to be there for Orion when he fledged. We will continue to be there for him. Rochester Watchers out this weekend included Dan S, Jeanne, Joyce, Brian H, MAK, Dana, Lou, Kathy O, Larry O, Marcia, Shaky, Carrie, Linda, Pat, and Carol P. If I forgot someone, I apologize. You gals, guys are the best. The weather has been brutal, especially during the afternoon hours when there is no shade in sight. Today there were 4 of us lined up in a small couple foot wide strip of shade up against a wall. Other times, we’ve resorted to umbrellas. Sunscreen, hats and lots of water are a must. This morning, we were all thrilled to watch Orion make his way out onto the well wall, all the way to the north end. He doesn’t walk slowly, he speeds over that wall, wings out, feet sometimes not touching the hard surface below him. He continues to strengthen his wings and all the muscles he will need for that first flight. Flap, flap, flap, flap! Faster and faster and feet lifting off the ground and a soft breeze lifts under his wings and …….flight! Wings continue to beat, up, down, up down, free! Beauty and Dot.ca will probably join Orion on his first flight. They may try to guide him, as Beauty guided Jemison back towards the TSB when he attempted to fly too far over the river. His parents will be there for him. They are always close. As nervous as these first flights are for us to watch, I never tire of seeing them. They are amazing. Tomorrow is another warm day. 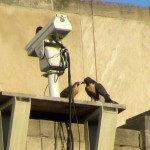 Will this be the day he fledges? If so, we will be there just in case he needs our help. 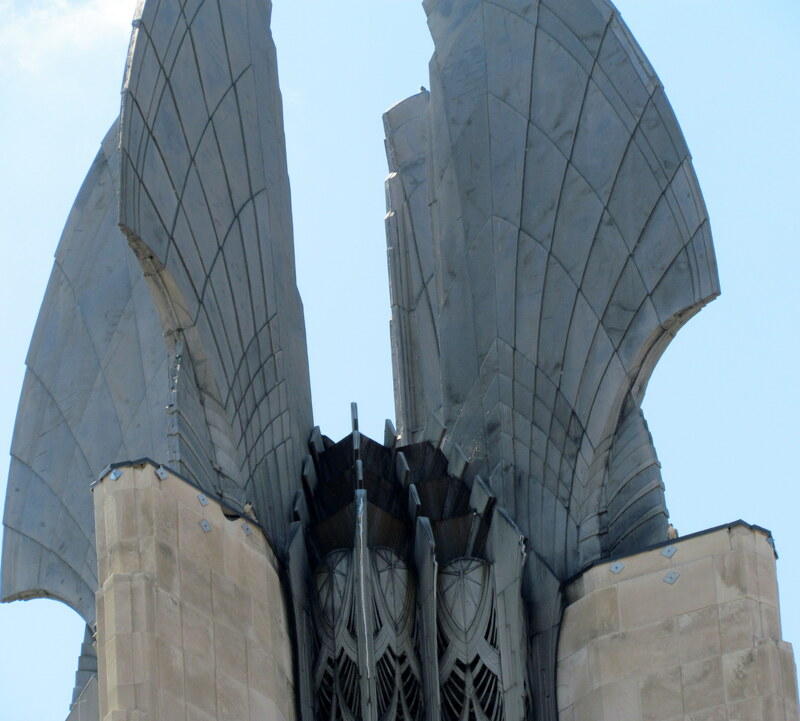 You can bet that all the Rochester Watchers that gather downtown tomorrow will be keeping their eyes to the sky! When I arrived, Carol P and Dana said that Dotca was at the Old Changing Scene Restaurant ()CSR) I beam. Orion was in the nestbox. 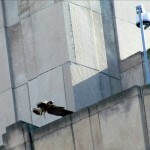 After a few minutes, Beauty fly by fast from the direction of the jail, past the nestbox and past OCSR. Orion started wailing upon seeing his mom. Soon after, Dan S. and Joyce arrived. 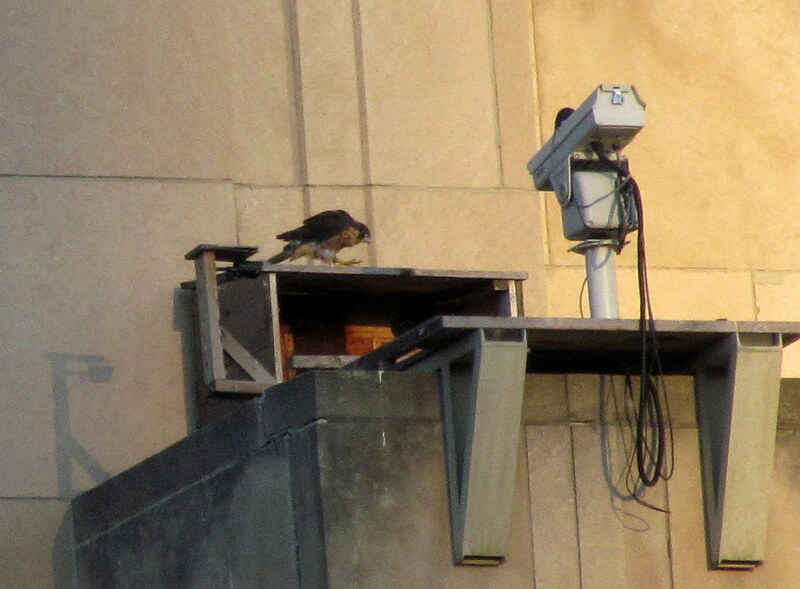 We moved farther up BTB (Broad Street Bridge) so we could see the nestbox clearer. 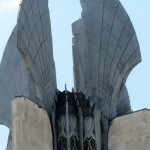 As we did this, Orion again started to wail– he saw his dad fly to the building. Dotca went to the top left ring. Orion looked up. He then went atop the nestbox, flapping. 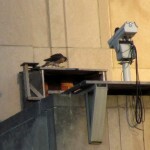 From there, he went to the side of the nestbox and walked along the edge. He went into the nestbox. Dotca flew off the ring in the direction of the Hyatt but we lost sight of him. All stayed quiet in the nestbox! As an aside, last night, Dan S. and I witnessed something really unusual. A great blue heron landed on the bridge railing! It was only for a brief time but we had not seen that before! So Carol picked me up and we made our way downtown arriving about 8:30am. 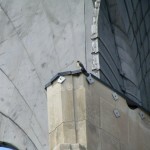 Dana was there already parked down in the hole Aqueduct St. Dot.Ca(DC) was on the northwest wing ring,Beauty was on the west corner 2nd ibeam of OCSR and Orion was being quiet up at the nestbox. 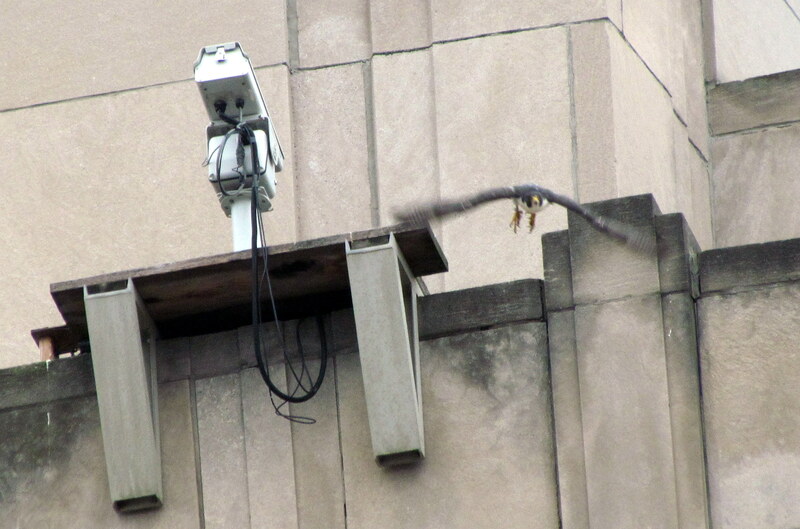 Half hour later DC flew to land under the northeast wing on the Times Square building(TSB). DC then flew off to the south fast. At the time I thought breakfast is on the way! Next thing we know DC came shooting out from behind the TSB flying east, he then returned and dropped food off to the singer. DC flew to OCSR briefly landing before taking off for the was on thetippy top of TSB landing on the northwest wing ring. What a busy guy! After Beauty brought Orion food DC then settled over on the top ibeam south side of OCSR for a while. Orion and mom hung out on the deck. 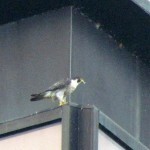 Dan came by just before 11:00 and Beauty flew over to the OCSR building coming to rest on the west corner 2nd ibeam. It remained this way for a long time and it was quiet time for Orion. DC went under the northeast wing on the TSB and KathyO joined the watch. A while later Dan left after Beauty flew northwest and DC went south right after. KathyO had to be leaving soon and since my head was pounding and my back hurting I grabbed a ride home from her. I always smile a lot when I’m watching falcons with my falcon friends no matter what! 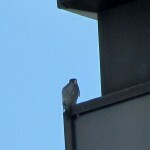 Watchers Tonight Between 4:00 & 8:30 pm: Marcia, Dan S, Dana, Aaron, Joyce, Jeanne and Carol P.
On my way out of work today, I spotted what appeared to be a Falcon on the water tower in front of my building. Could it be a Peregrine. Seemed big enough, but very dark. Hmmm, maybe a juvie? I parked on the side of the road and took some pictures. Not a Peregrine, but a very beautiful Merlin. Nice! OK, onward. I arrived downtown at approximately 4:00 pm, just as MAK and Lynda were leaving. 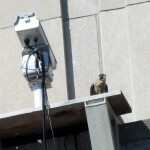 Marcia was down at the bottom of the stairway at Falcon Central sitting in a very narrow strip of shade. At that time of day, if there are no clouds, it can be really hot. You are looking directly into the sun. 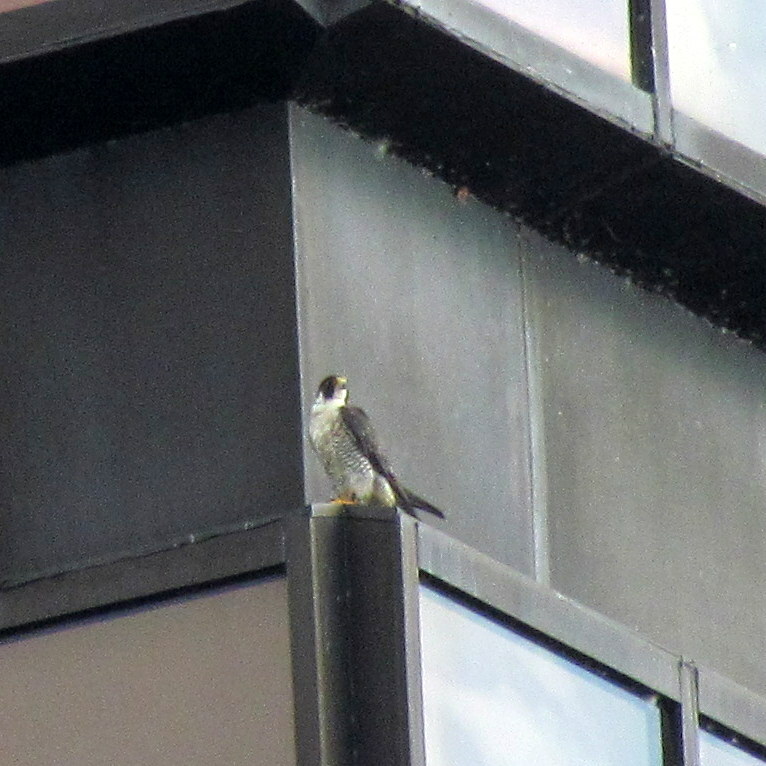 As I was saying goodbye to MAK and Lynda, a falcon flew past the Times Square Bldg (TSB), heading south. 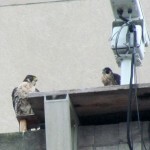 Had to be Beauty since Dot.ca was up at the base of the NE wing of the TSB and Orion was at the nest box. After they left, I joined Marcia, sharing her narrow strip of shade. Nothing happened for the first hour. But we did get a lot of visitors when the visiting Jehovah Witnesses finished their day at the Blue Cross Arena. At 5:00 pm, Dot.ca started to hunt. He took off heading towards the river and returned to the TSB. 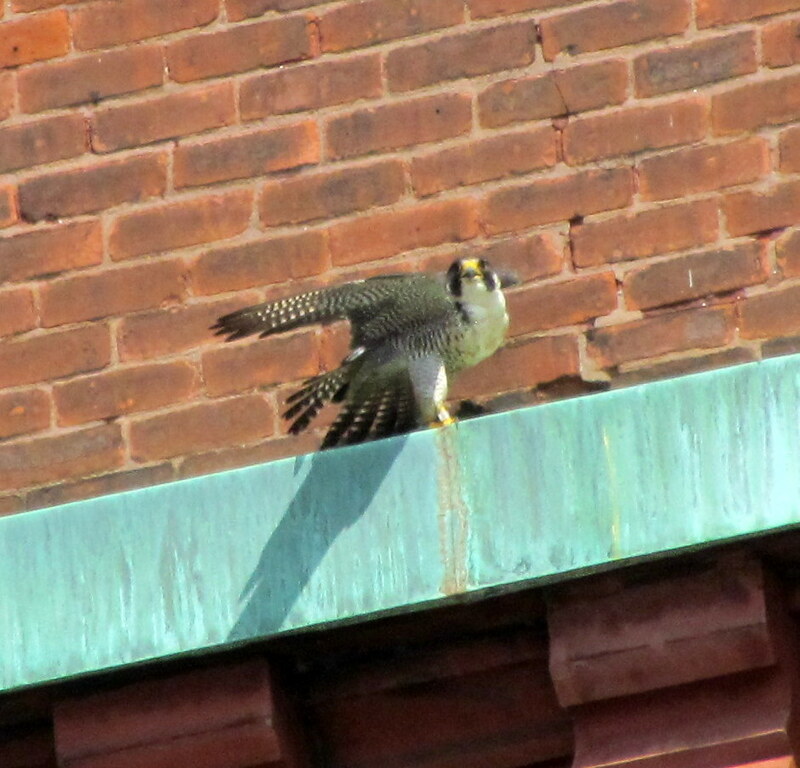 Then he took off again and ended up on the top IBeam of the OCSR. During all of this, Orion could be heard yelling encouragement from above. While Dot.ca rested on the top IBeam, Marcia and I walked around a bit. We finally found Beauty. 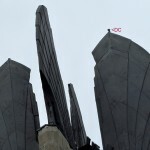 She was up high on the jail’s communication tower, facing the TSB. Not far at all, but continuing to stay at a distance, I think due to her molt. She remained there for a couple hours before taking off. We did not see where she ended up. At 6:18 pm, I received a text from Ei and Kathy O at almost the same exact time. Orion was on top of the nest box! Marcia and I walked further back and saw him up there, flapping away. 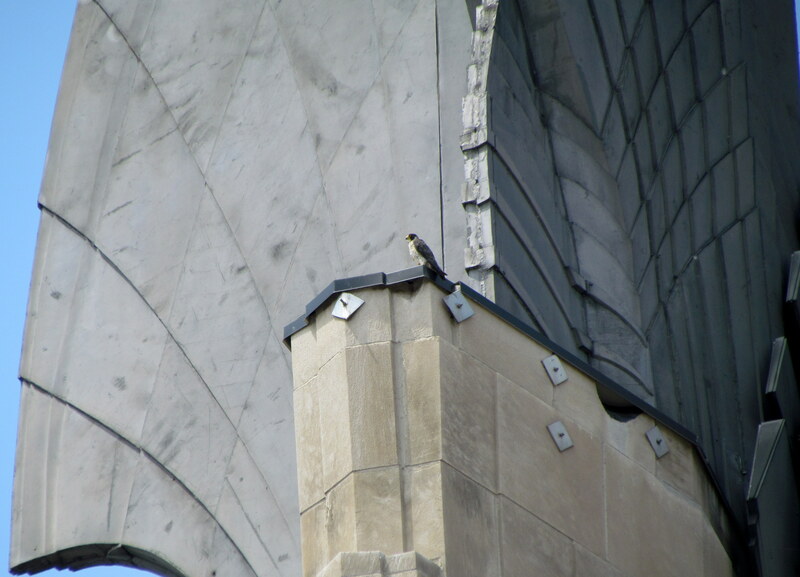 We stayed where we could see him, just in case he decided to fledge. 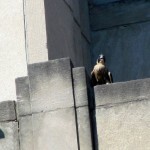 At that time we were joined by Dana and Dan S. We all watched as he flutter, flew down to the platform in front of the nest box. He ran around a bit and finally settled down. At 6:40 pm, Dot.ca took off heading south, fast! He returned empty taloned and again landed at the base of the SE wing on the TSB. He stayed there until about 7:30 pm and STOOPED down the face of the TSB! Whoa! Second night in a row! So cool! This time he was not as lucky as he had been last night. He came up, again empty taloned, and landed on Mercury’s head. 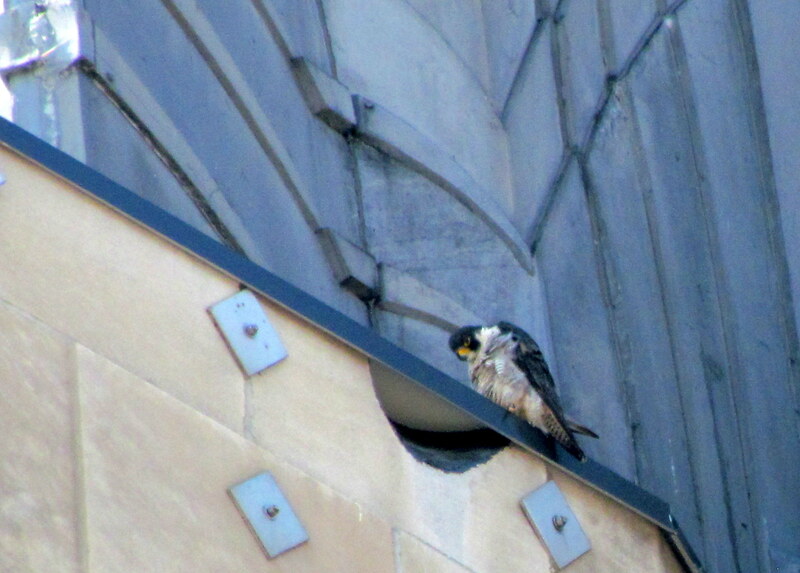 The whole time he was there, his head was in constant motion, swing left then right then up and down and PREEN! Oh, now an itch! Stretch a wing, now a foot. Stare down at the pesky Watcher taking pictures from way below. Loud noise! Jump! What was that! and that screaming from my boy! 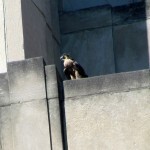 At approximately 7:30 pm, he took off and headed back to the TSB, landing at the base of the SE wing. Orion greeted him, loudly. In the meantime, we were joined by Joyce, Jeanne and Aaron. 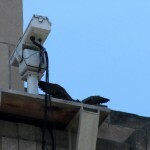 Dan decided to watch from the middle of the Broad St Bridge, while the rest of us remained up closer to the building. Dan loves to watch them hunt and fly over the river and when Dot.ca took off, again heading south, Dan was the only one that could tell us where he went. According to Dan, Dot.ca made a slow stoop over the Cornhill area, but did not catch anything. D.C. continued to fly higher and higher, heading further south. We did not see him return and wondered if he might have gone over to the Brighton Site to visit with Pigott. There was no way to know for sure. At 8:00 pm, all of us decided to call it a night, except for Dan and Jeanne, who continued the Fledge Watch out on the BSB. I said my goodbyes with a promise to be early downtown tomorrow morning. So, no fledge by Orion today, but it is definitely going to happen soon. Will it be tomorrow? Or maybe Sunday. I really do think it will be sometime this weekend. That little guy is ready to join his parents. To explore the world outside his small little nest box. I do love seeing these beautiful creatures learn to fly! That’s why I always keep my eyes to the sky! On the way home, I drove around downtown to try to find Beauty, but had no luck. I did find KPT at KP sitting on the catwalk on the west smokestack. 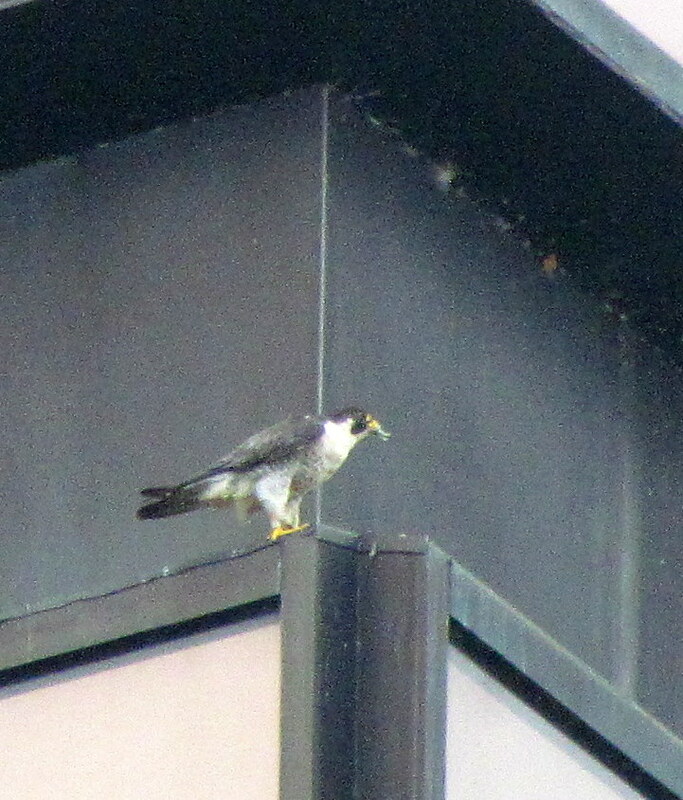 As I approached the Times Square Building(TSB) after getting off the bus at 6:40am I could see an adult pefa with it’s back to me on the southeast corner of the nest box deck. As I made my way up Broad St. and turned around to look I could see Orion was being fed. Donna let me know it was Dot.Ca(DC). Thanks for your help D! I took a couple pics and then suddenly Dan appeared next to me in his car. Wow I haven’t watched falcons with him on the bridge during the early morning hours in a very long time. Needless to say I was elated! I have been trying to stay close to the TSB in case Orion comes off but this morning I made an exception and went up on the Broad St. Bridge(BSB) to sit with my #1 mentor Dan. He stayed for an hour and then I went back down to Falcon Watcher Central(FWC). 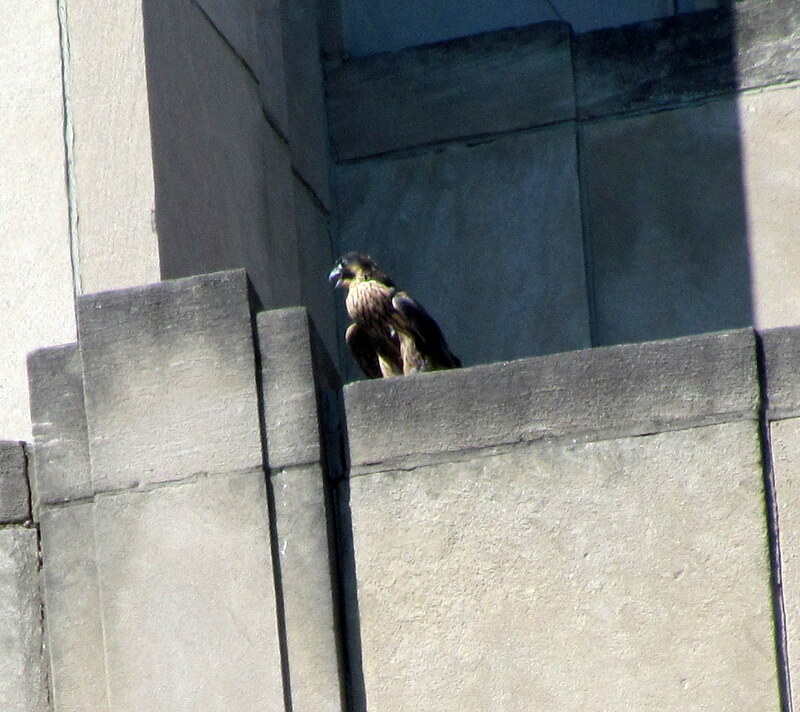 DC flew up under the southeast wing after he finished feeding junior. 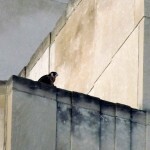 He stayed up there for quite a while and during that time the Jehovahs Witnesses started filtering in from all directions to convene at the Blue Cross Arena(BCA). They are in town this weekend and next. DebbieH stopped just long enough to say hi and have a chuckle with me as she was running late for work after having a hard time leaving her computer and the live streaming video of Orion. I told her she might need an intervention as many of us do! DC flew south in a hurry and landed on the south corner of OCSR top ibeam a few minutes later. After preening and watching Orion for about 40 minutes DC left. 15 minutes passed and then I spotted Beauty for the first time on my watch. She was on the west corner top ibeam of OCSR one of her favorite spots as DC prefers the south corner. For the next hour she remained there as Brian joined me and one of the Jehovahs Witnesses, Bob stopped and asked about the falcons and gave us his opinion on the state of the world. Some interesting conversation indeed! Beauty left and nearly an hour later I spotted DC on the Wilder building green strip. 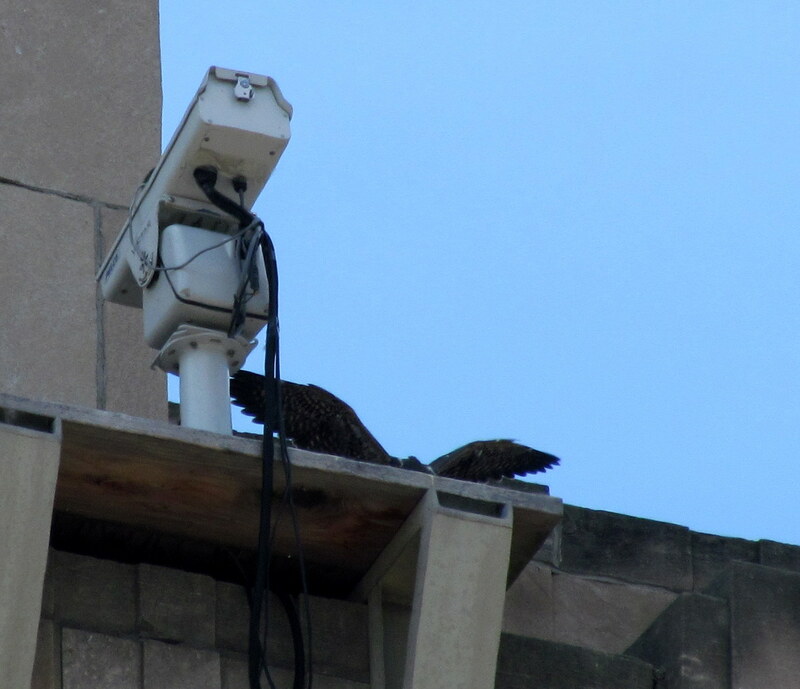 Beauty reappeared on OCSR on the 3rd ibeam west corner briefly before heading over to the base of Mercury to preen and pluck her molting feathers. I was told that when birds molt they get moody and their behavior changes. Well I’d have to agree because she certainly wasn’t herself today staying away most of the day and not going to the nest box in the 9 hours that I was on watch. 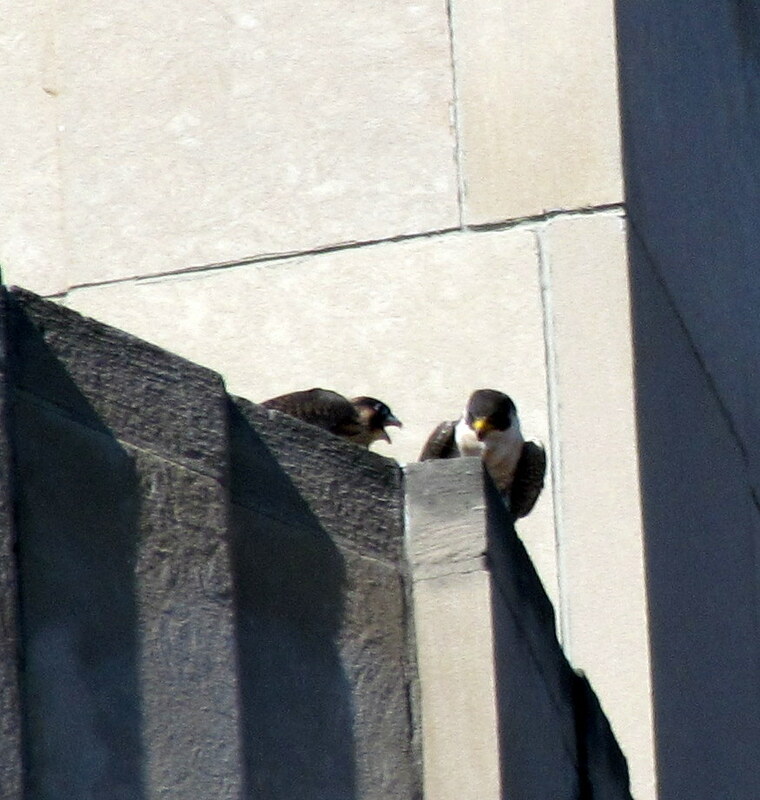 That’s ok cuz dad stepped up and kept an eye on our little singer who had a lot to say to DC while he was on the Wilder building. Brian left around this time as Beauty and DC both were fanning out their wings to cool themselves. Just around noon Aaron stopped by followed by Patsy. They stayed a few minutes then moved on out. Beauty flew east across the river very fast and quickly left my field of vision. DebbieH joined me on her lunch break at this juncture of my watch. 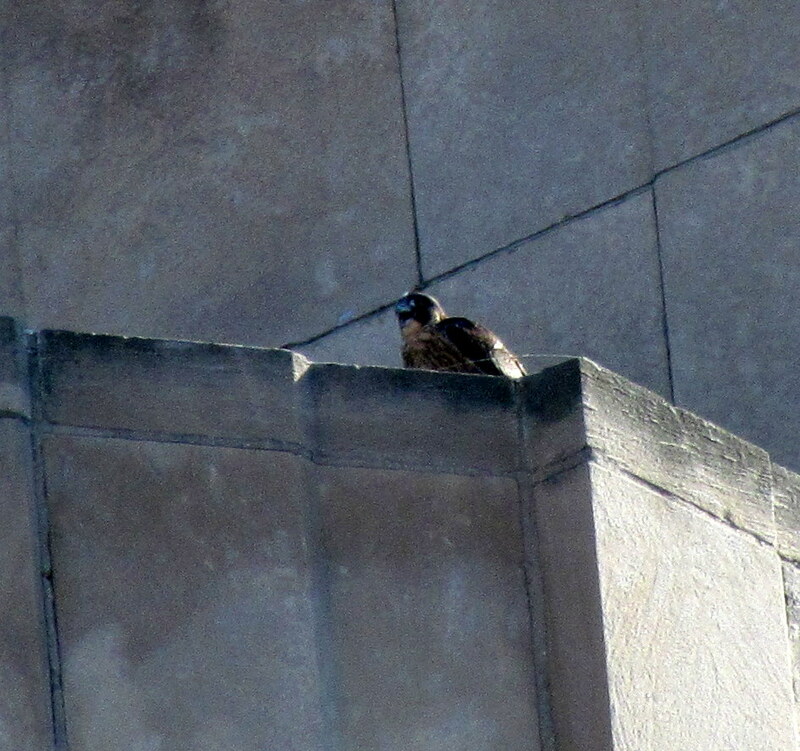 DC flew in to perch under the southeast wing on the TSB. No sooner did Deb leave then Lynda showed up. We were up on the sidewalk near FWC but it was too warm for Lynda so we went down the stairs to the hole and set up our chairs in the shade to eat lunch. Orion was flapping his wings and singing lots to dad above him as Willie joined the watch. DC left for a short time returning to land on the southeast column a level above the nest box only to leave quickly flying over us due east. 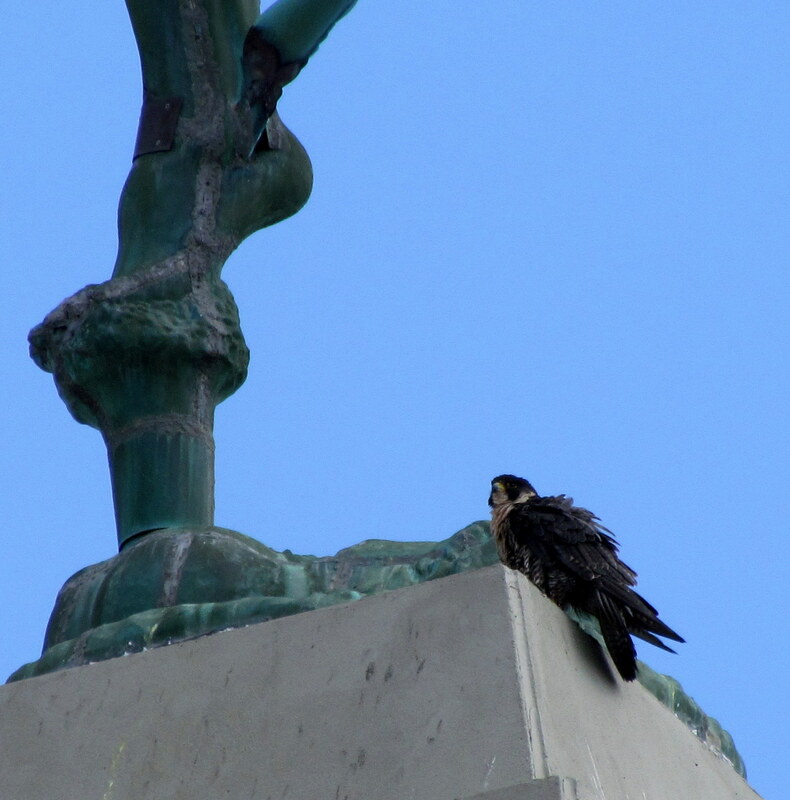 Marcia came for her scheduled fledge watch and a few minutes later Willie was on his way. DC flew through the area a couple times kinda low before doing a vanishing act. Of course this would get Orion squawking and then he went to Callidoras corner-maybe to pout. 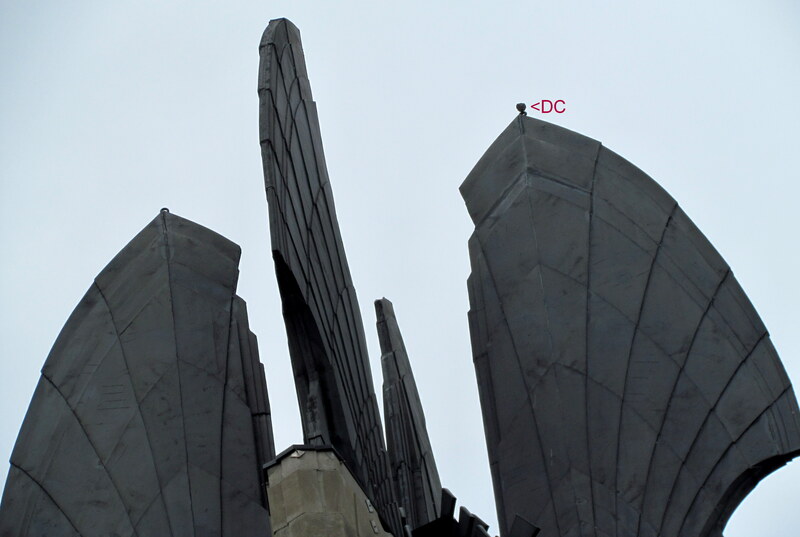 lol DC returned and landed under the northeast wing and that would be where Lynda and I called it a watch. As we were packing up to head out CarolP arrived and after a little chit chat we left and she joined Marcia down in the hole. 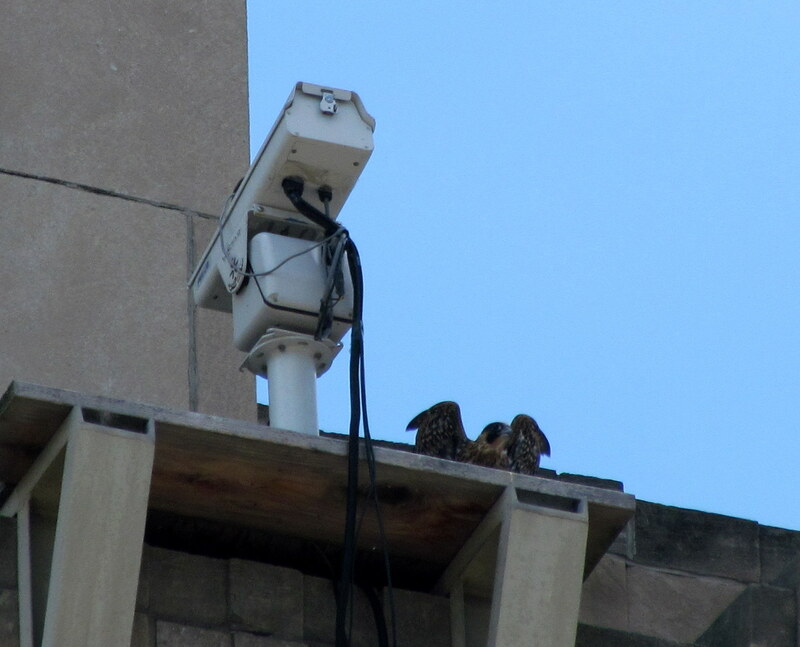 I think Orion is very close to fledging which is always a scary thing for us humans but when he does rest assured that the Rochester Falcon Watchers will be there to help him out if need be. In the mean time enjoy him on cam and livestream and keep smiling! Watchers: Aaron, Dan S, Jeanne, Joyce, Kathy O & Carol P.
I again went straight from work to start my fledge watch at about 4:00 pm. 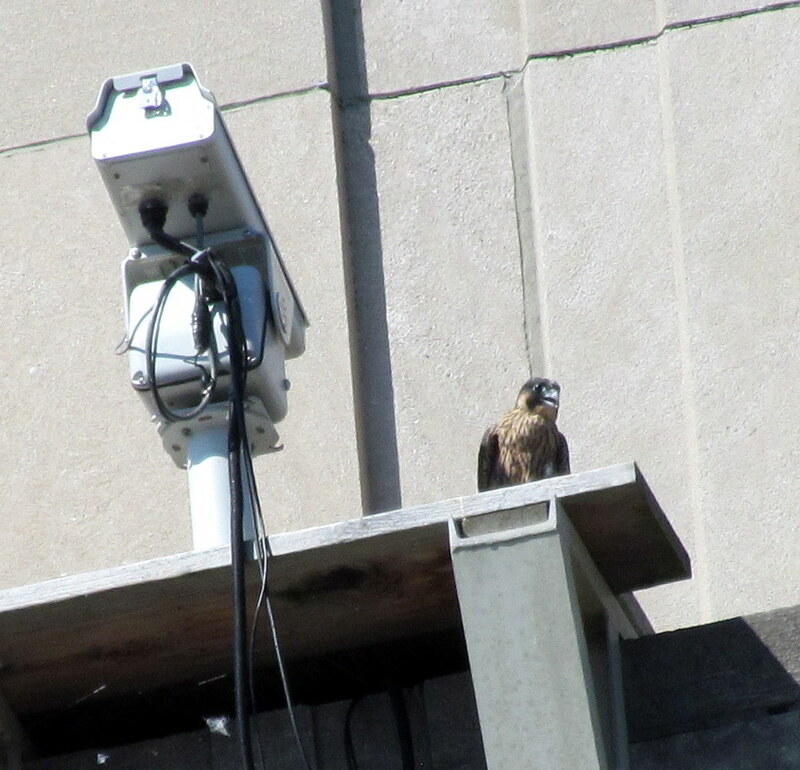 When I first arrived, I parked on the Broad St Bridge (BSB) and quickly found Beauty on the top IBeam, south side of OCSR, Dot.ca on the base of the SE wing at the top of the Times Square Bldg (TSB) and of course young Orion in the nest box. All three seemed settled, so I decided to stay on the BSB since no other Watchers were there at that time. I parked my car where I could see all three falcons, and settled in for my fledge watch. For close to two hours, there wasn’t much activity. Just a bit of moving around. I was visited by Debbie H when she walked across the BSB to meet her husband. It’s always nice to see Debbie and others that work downtown and love watching the falcons. It was just before 6:00 pm, when Dot.ca stooped down the front face of the Times Square Bldg. I’ve seen Mariah, Kaver and Archer do this same thing and I never tire of it. It is incredible to see! Because I was on the bridge, I lost him behind the buildings between me and the TSB. 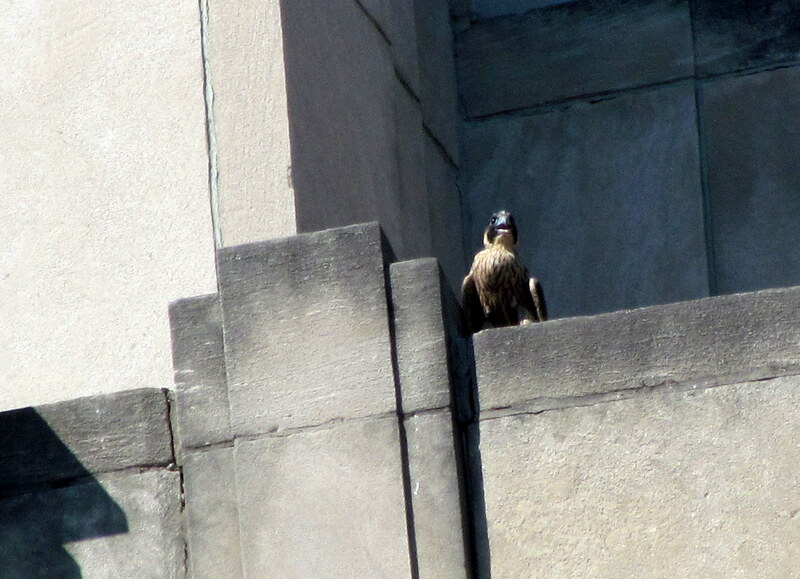 But, he soon came out over the river on my right side chasing and then catching a pigeon there. At first I thought, whoa, had Beauty come off the OCSR? Nope she was still there. 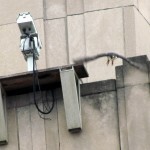 I watched, amazed as Dot.ca caught the pigeon and carried it back towards the TSB. I quickly started my car and followed. 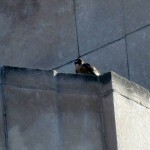 When I arrived at Falcon Central, which is on Broad St, closer to the front of the TSB, I saw the Aaron was there. I quickly joined him and got the scoop of what he had seen. Like me, he saw Dot.ca dive down the front of the building and hit a pigeon. 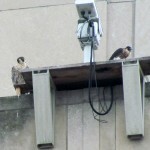 The pigeon took off and there was also a 2nd one. He chased both out over the river, where Aaron lost sight of them and I picked them up. 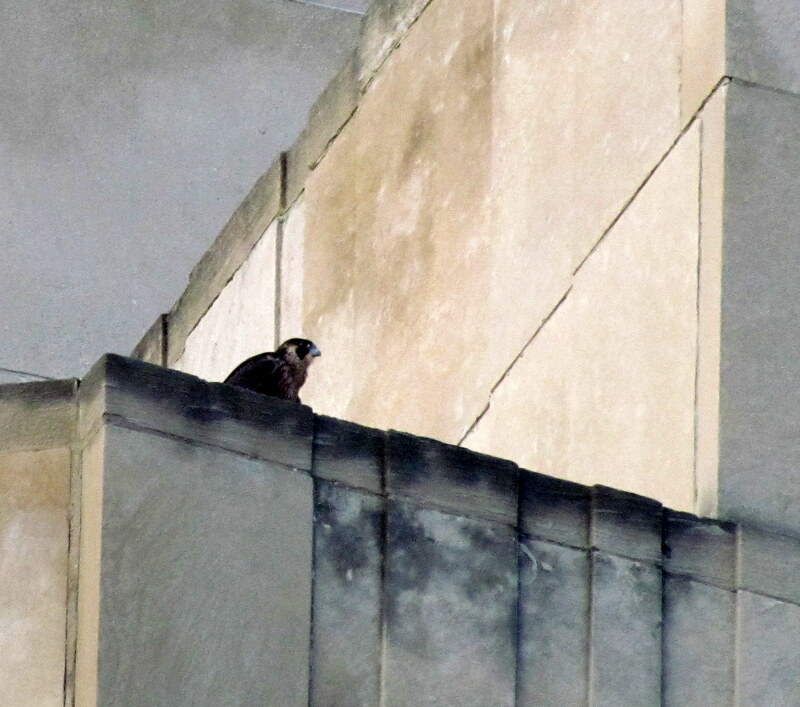 After he caught the pigeon and headed back towards the TSB, Aaron saw him fly to the right (north) side of the TSB where he lost him behind the Philipone Bldg. He thought he might have been heading towards the Powers Bldg. Fascinating that we saw two different views of the same event. I got back into my car and drove all around the area surrounding the TSB, but had no luck finding Dot.ca. I returned to Falcon Central just in time to see what seemed to be 30 or more police cars and vans converge on the area. I don’t think I’ve ever seen so many. As Aaron and I watched, about 50 people came walking down Exchange heading north, right in front of the TSB. I’m not 100% sure what they were protesting, but they sure had the attention of the Rochester Police who were all over the place. That was very, very strange. Back to Falcon Watching. 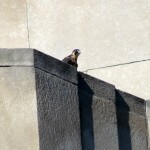 For awhile, we waited to see if Dot.ca would bring his prey up to the nest box. Every now and then a pigeon feather would float by us, so we assumed he was close by and that the feathers were being blow by the wind to out location. We didn’t have long to wait. 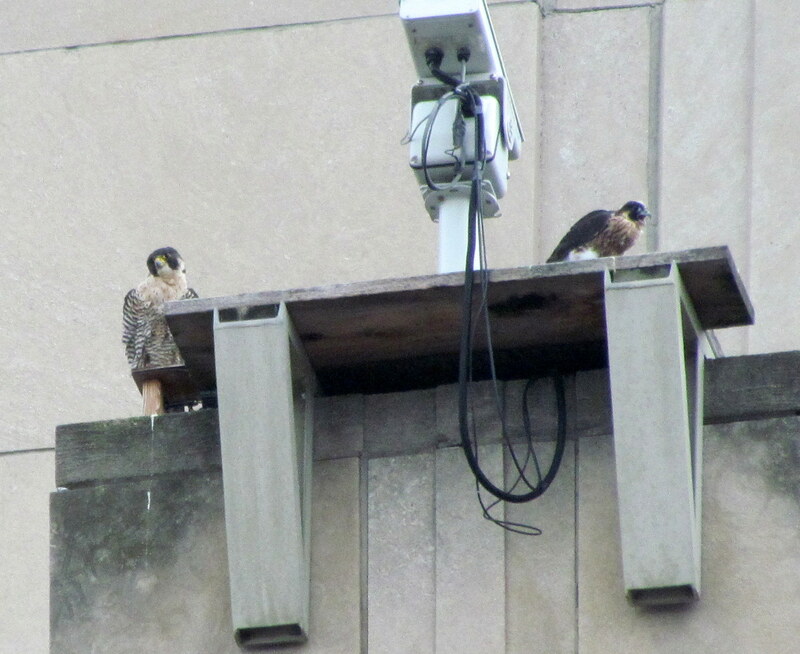 Dot.ca flew in from somewhere behind the TSB and up to the nest box. I knew he was carrying something but not sure what. Aaron checked his pictures and we saw it was just a piece of the prey, which included the leg/foot. 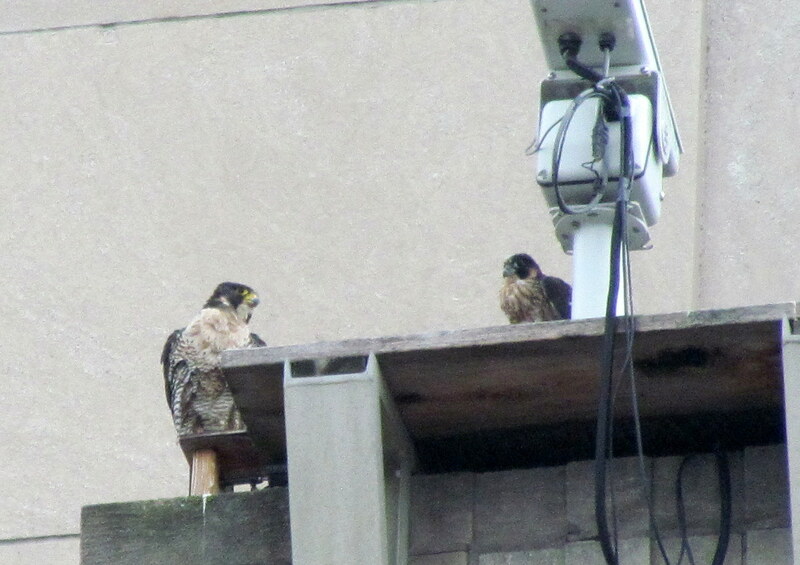 We could see movement on top of the nest box platform, but we couldn’t tell if Dot.ca was feeding Orion or not. I walked down in front of the Blue Cross Arena aka Rochester War Memorial and saw two heads bobbing up and down. Every now and then I would see Dot.ca feed a piece to Orion. I returned to Falcon Central to join Aaron there. 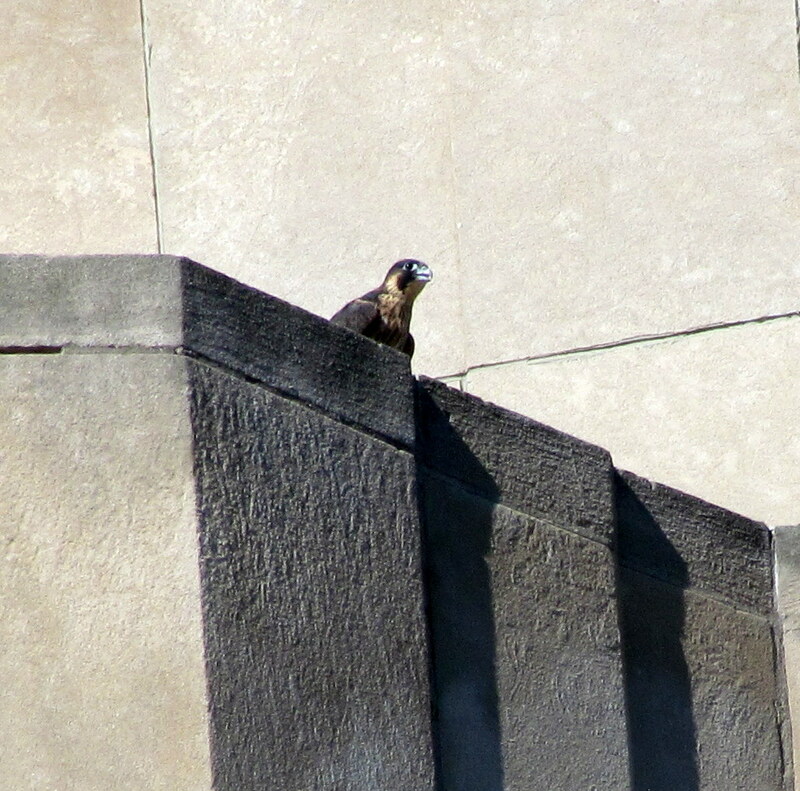 Dot.ca finished eating/feeding Orion and flew up to the base of the SW wing. Beauty never moved from the top IBeam of OCSR the whole time I was there. I really do believe her molt is holding her back a bit, just like one year when Mariah went through a molt. Soon we were joined by Dan S, Jeanne, Joyce and Kathy O. 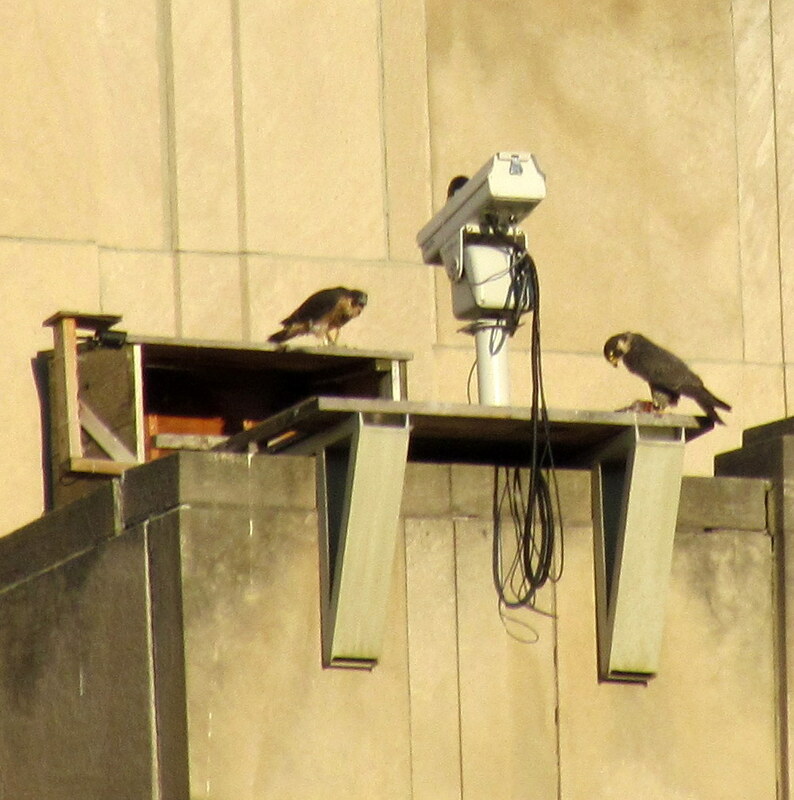 We all settled in for an evening Fledge Watch, although there wasn’t much activity at all. We saw Orion flap his wings for awhile after eating, but then he settled in the nest box for a nap. Just before 8:00 pm, Dot.ca took off and did a slow, leisurely stoop down low over exchange, heading south. We waited to see if he would return, but he didn’t. Maybe going over to the BS location to visit with Pigott??? Before joining us, Joyce had spent some time over at KP with KPT. At 8:00 pm, I decided to call it a night. Kathy and Joyce also decided to leave. We left Dan, Jeanne and Aaron to continue the watch. I still think it will be 2-3 days before Orion decides to take that first flight, but it’s good that the fledge watch has started. You just never know when it will happen. We’ll keep watching!